This story begins before Jacob and I were even engaged, and he was living in LA and I in Rome, and we were chatting on the phone. I'm sure I was in the middle of some spill-all about the misery of long distance dating when Jacob informed me that there were bees swarming outside his window. That day the bees moved into the shed outside of the converted garage where Jacob and I now reside. Jacob became very fond of them, got them a hive, and moved them farther from the house. And so the love affair continued underneath the avocado trees. 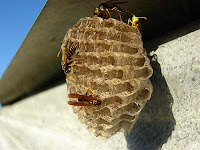 The first few years were glorious, filled with gallons of honey dripping from cheesecloth for days, beautiful bricks of golden beeswax, and busy busy bees perpetuating our backyard ecosystem. We quickly resolved to get more bees. So Jacob posted a Craigslist ad, and I covered the freecycle.org market, seeking a "Swarm of Bees." 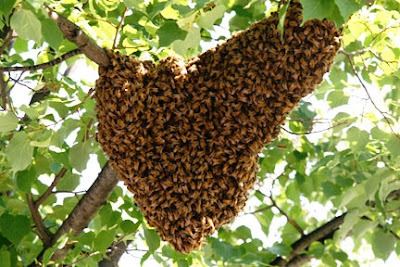 Within twelve hours we'd heard from a woman in Santa Monica who informed us that a swarm had moved in under one of her eaves and we could come get it whenever. We were stoked. 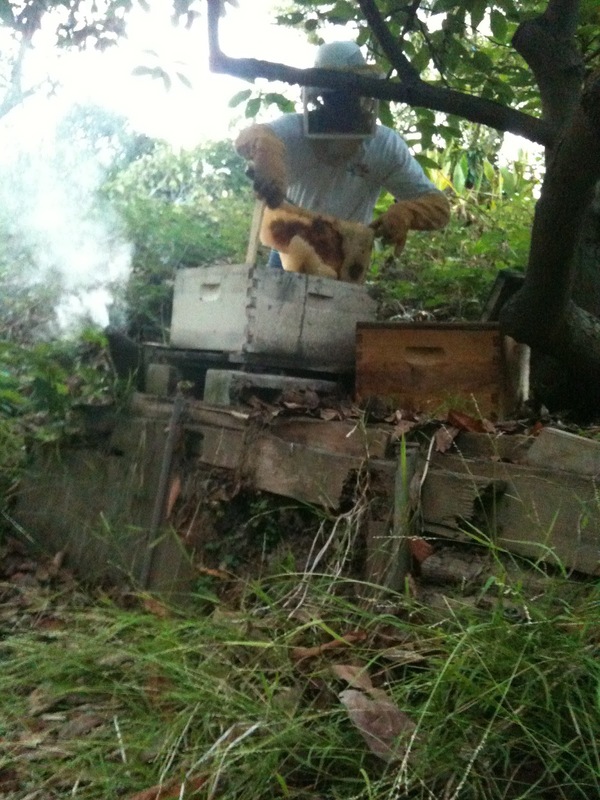 Jacob checked his hive for mold, cleaned out the ants and old comb, and moved it to a sunnier, dryer spot. Finally, last weekend Jacob, his brother John, and I went to go pick up the bees. We arrived excitedly toting all our materials. The woman walked us around and pointed at an eave high above a porch roof. I'm sure we made a pretty sight, the three of us standing in a row, with the bee-veil and the gloves and the smoker and a big cardboard box and a shovel, all staring at. . .an abandoned wasp's nest. We tried to be understanding. John did his due diligence and climbed up on the roof to both knock it down and assure the woman that it was indeed an old wasp's nest and not a swarm of bees. We put on happy faces, but it was all very sad. The three of us walked back to the car rather dejected and then proceeded to treat ourselves to frozen yogurt. You are the cutest. How could bees not move into that at first sight? Soon, I'm sure. i love this so much! miss you. Aw! Empty-nesters! 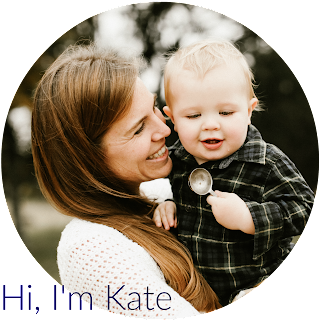 :( Kate, this is so sweet. But I'm really sad about the bees disappearing, too! You're sure to get more soon. I remember you talking about the bees in Rome! If you want bees to come rent in LA, you need to make your box a little more snazzzy. Some lights, perhaps a few pictures of Marilyn Monroe, and a bottle of beer. If I were a bee, I'd go there.